Trace Michigan’s Copper Country strike from its hopeful start to its heartrending conclusion. 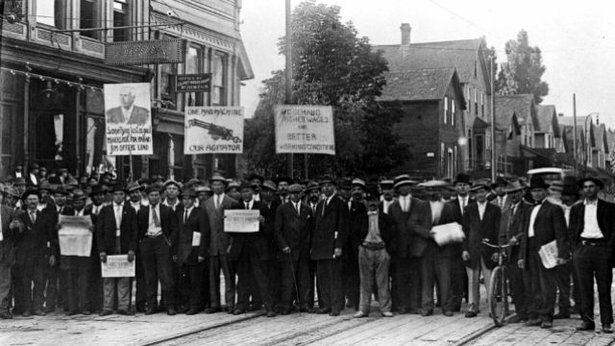 Red Metal: The Copper Country Strike of 1913 is a new documentary that focuses on the 100th anniversary of an epic labor strike that devastated Michigan’s Upper Peninsula Copper Country – and haunts the American labor movement to this day. Among the notable elements of that strike was the death of 73 children at a union Christmas party in what is now Calumet, Michigan. Known as the Italian Hall Disaster, it remains the deadliest unsolved manslaughter in U.S. history. The tragedy (attributed to strikebreakers yelling “fire” in a crowded auditorium) was immortalized by Woody Guthrie in his ballad “1913 Massacre,” performed in the film by Steve Earle. Red Metal: The Copper Country Strike of 1913, narrated by Richard Harris, traces the Copper Country strike from its hopeful start to that tragic conclusion. Between those endpoints, the film explores the intensifying battle between organized labor and corporate power, as well as related issues of immigration and technology. Of equal significance is the strike’s cultural legacy, which influenced national discourse, music and legislation during the Progressive Era. As the centennial of the Italian Hall Disaster approaches, a new generation of Americans has begun paying tribute to the victims, while also deliberating the strike’s causes, outcomes and legacy. Red Metal: The Copper Country Strike of 1913 was produced by Jonathan Silvers. Own this DVD to explore the race riots of Detroit in 1913.